Yesterday, a new ban against fish containing anisakis worms was published (reproduced below). This one has Rav Elyashiv and Rav Wosner signed on to it. I posted about this topic last year on three occasions. In my first post, I argued that although Chazal permitted such fish based on a misunderstanding regarding how these worms are generated, their ruling is nevertheless binding. In my second post, I analyzed Rav Belsky's responsum permitting such fish, and I argued that those rabbonim who prohibit it are effectively undermining Chazal due to their acceptance of science - which is odd, because that is exactly what they condemned me for doing! Finally, I posted a (fake) kashrus alert about honey not being kosher, which illustrated the logical corollary of prohibiting fish containing anisakis worms. But whether one thinks that anisakis worms are permitted or prohibited, this latest giluy da'as is notable for perfectly illustrating the innovative charedi approach to rabbinic authority. Traditionally, halachic verdicts were given in the form of responsa - detailed explanations of how the verdicts were reached. But today we have verdicts with no explanations. Furthermore, traditionally, different places, and certainly different countries, each followed the decisions of their own halachic authorities. 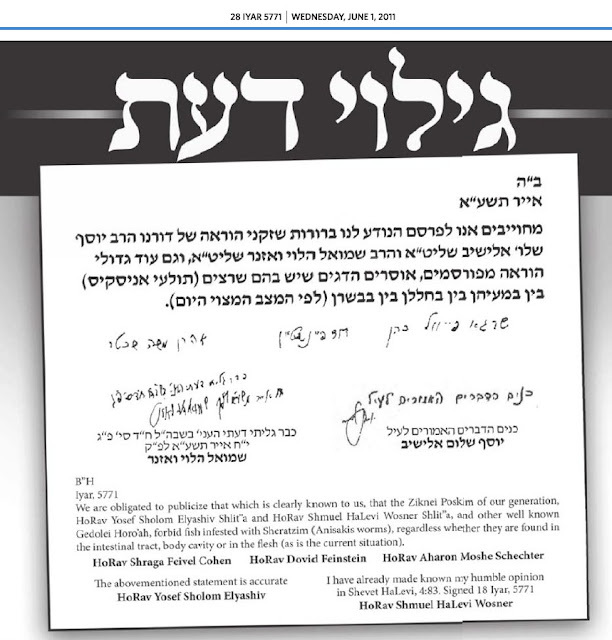 Yet here, the signatures of Rav Dovid Feinstein, Rav Feivel Cohen and Rav Aharon Schechter appear under a letter in which their prohibition is apparently based upon their endorsement of Rav Elyashiv and Rav Wosner as being the senior Gedolim of our era, instead of as a result of they themselves having researched the topic and concluding that this fish is prohibited. This is a novel and disturbing approach, and one can only hope that the OU will maintain the courage and integrity to stay with the traditional approach to halachic authority. The American Rabbonim never say they support the psak. All they say is that they affirm it's authentic. I suspect that at least one of them (perhaps two) actually feels as you do and the text represents a compromise in order to get them to sign. The more interesting story is why someone would be pressuring them to sign in the first place. But why would they need to affirm it's authentic? Anyway, it certainly gives the strong impression that they support the psak. I don't think that many people will think otherwise. Everyone knows that it is authentic - the only dispute is whether the psak is correct or not. There's actually quite a few interesting things about this notice. One is that the American rabbonim are not merely deferring to the Israeli ones in their psak - they are merely testifying that this is the psak of the Israeli rabbis. Strangely, Rabbis Elyashiv and Vozner go on to affirm the American rabbis' testimony - which leads to the question of why the American rabbis' letter is needed at all - perhaps it is merely for them to demonstrate subservience to 'papal' authority. What's most worrying is not Rav Vozner's psak, who at least has published voluminous shu't and has written on this topic specifically, but rather Rav Elyashiv's - we have no idea what it is based on or why he came to his conclusion; as far as I am aware there is little published material from Rav Elyashiv on anything - even his 'Kovetz Teshuvos' are largely record of pesakim that he, along with other dayanim, reached when they were serving in the rabbanut. This style of psak is obviously extremely open to abuse by various interested parties. As an example, in the dispute over the eruv in NW London, much of the argument was over what Rav Elyashiv's position is, as there are numerous conflicting reports, and his own writings are concise and provide little rationale for his positions on the topic - I honestly don't understand why halacha has to come to this. I have a feeling that there is a part of Rav Elyashiv's circle that wants things to be this way - they want to control access to the 'oracle' and they want everyone else to have to demonstrate their subservience by beseeching to know what exactly was said, and, if they're really lucky, why it was said. What's also interesting is that Rav Elyashiv's name is spelled without a 'mem' in the main body of the text, yet under his signature his name is written with it. If we buy fish fillets at the supermarket, how do we know if they ever had these worms? Whose responsibility is it to check? Do kosher fish mongers look for such worms? What can one do when he see a train heading for a cliff, and everyone on the train insists it can fly? I've been watching Charedi "leadership" turn into goyim for years.. this is just getting worse. Isn't this the mirror image of the brain death issue? Shouldn't a psak change based on a better understanding of science? No! I specifically stressed that brain death is different, because it's a matter of life-and-death. That takes precedence. Otherwise, authority of Chazal is paramount. I dunno. We already know that Rav Kanievsky will sign anything that has other signatures on it. Rav Eliashiv is on record saying that if you didn't hear it from him directly you don't have to assume he actually said it. Where did this come from? Someone typed it up and even played in Photoshop to make this advertisement, to say nothing of someone placing it. R. Elyashiv's line does *seem* to be referring to the text above (let's say it does) but R. Wosner's is not, or at least isn't clearly. Who showed them the text and got their signature? How come the public is not entitled to know how these mysterious documents which seemingly spontaneously generate are generated? And . . . why these three? Who says there is not a responsa? Do we know that for sure? Presumably there also needs to be a way to publish the ruling without having to publish the whole responsa for those who just want to know what the halacha is. Furthermore how do you know that traditionally all responsa were in written form? Maybe some were written and some were oral. And the reason why more are oral nowadays is because in the old days the responsa was part of a letter correspondance with the Rabbi. Nowadays with modern communications this is less prevalent. This is not a completely new phenomenon, this has been happening, on the increase, for the past 2 decades. Your books were 'banned' by the charedi authorities in the same manner-short paragraph explaining that the books are banned(no real explanation) followed by signatures. Most, if not all the rabbis will have signed because they saw the signature of another 'gadol' and not because they had read your books thoroughly and decided that its content is really kefirah. It is a very disturbing, but not completely new phenomenon. Natan, I don't think that the chareidim are being innovative here. I think that they are wondering why we don't follow the age old custom of following our leaders. Questions that have global ramifications, such as is a particular food Kosher or not, should be brought to the "supreme court". The average Rabbi is not capable of shouldering the responsibility to prohibit or permit to the masses. In our time, Rav Elyashiv is looked upon as the supreme authority for chareidi Jews, and therefore these great Rabbis in America are saying we should follow their opinion. We have managed without a Sanhedrin for a long time. And this is not a question with "global ramifications" any more than other kashrus questions. There are plenty of Poskim in America that are perfectly qualified to issue rulings on this. Personally I couldnt give two hoots about some anonymous "psak", that may not not be forged, by rabbis I dont consider to be my own, without any underlying reasoning. It's worthless, not even as a bottle-stopper. My fish purchasing habits wont change. But the troubling thing is that resteraunts and caterers feel the need to kowtow to Big Kosher. The community needs it more than ever, especially in this economy: a normal hechsher that uses bittul, that doesnt patchka around with da'as yachids and ain mivatlin issur lichatchila concerns, that doesnt get excited over some alleged signatures. None of this foolish "hechser tzxeddek" nonsense. Just a real hechsher on food. Rabbi Broyde, I'm calling on you to temporarily step aside from the Beis Din of America, and start this new national hechsher. Viyokreih shmo b'yisrael: Normal K.
I usually don't eat too much fish during the week but maybe I will start buying more salmon, its very healthy and its kosher. In light of this ban, I see it as my duty to eat more salmon. Rabbi Slifkin - do you think this move away from the authority of Chazal to the fiat of "Gedolim" (based on science [sic]) is any less illegitimate than conservative judaism's move away from the authority of chazal to majority rule? S - I just spoke to someone in Rav Dovid Feinstein's yeshiva office (Mesivtha Tifereth Jerusalem in NYC) who confirmed that Rav Dovid Feinstein did sign the letter. So, now we know it's not a fraud or a photoshop job. If you would like further answers to your questions, you're going to have to call yourself at 212-964-2830. Sorry in being so late in following up to the responses to my comment. I suspect that what happened was that certain askanim have a vested interest in promoting this ban at this time. They put the screws to the three Rabbonim appearing on this letter and two (the actual poskim) refused to cave. In other words, they refused to sign their concurrence that the fish is not kosher. WHat happened next was a compromise: They would simply affirm that it is true that Rav Elyasiv holds XYZ. This way, they would have the askanim off their backs. Because these askanim control access to Rav Elyashiv and one of these Rabbonim who signed visits with Rav Elyashiv regularly. All of the above is pure speculation, but is probably close to the truth. I strongly suspect that if someone would call Rav Feivel Cohen, he would say "I only signed that I agreed that this is Rav Elyashiv's opinion, not that I necessarily agree with it." In your opinion, is there any difference in "metzius" now then there was years ago? Does the way fish are treated now after they are caught (which is different) affect the migration of these worms from the intestines to the flesh? I think this way of doing things is part of the Yeshivish/Litvish world copycatting more and more the Chassidish ways of practicing Judaism. In this case it is the Yeshivish/Litvish world treating statements made by “Gedolim” the same as chassidim treat the statements made by their Rebbes. The only difference is that the Yeshivish/Litvish world is calling it a “Psak Halacha” even though it does not follow the traditional method or format of piskei halacha. When a Rebbe says something, there is no questioning him. He need not provide any logical reasons for it, and often he does not. His word is law regardless of his reasoning and regardless of the subject relating to halacha or hashkafa or something not related to either. A Chassidish Rebbe gives opinions regarding everything – not only on halacha and hashkafa but also on other unrelated details of a chassid’s life. Chassidim go to their Rebbe for PERMISSION and APPROVAL of their regular life decisions. Who should marry or not marry whom, whether one should enter into a business venture or not, if someone should buy a house or not, are all issues that chassidim need to get the Rebbe’s approval and permission for before acting on. His word, even on matters having nothing to do with halacha, is considered an extension of Hashem’s word. The Rebbe is considered to have “ru’ach hakodesh” and he is a direct connection (or conduit) to Hashem that the hamon am (general population) does not have. It is becoming this way with “The Gedolim”. 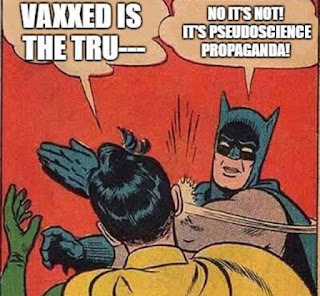 SD – “We are obligated to publicize that which is clearly known to us…” By saying that they are “obligated to publicize” something, they are effectively endorsing it. Otherwise, why publicize it? And why the “obligation” to publicize it? If they are going to later say “Well, I didn’t say I ‘support’ the psak, I only said I was publicizing it” then they are saying that their statement was purposely misleading, which is a pretty bad and dishonest thing for anyone to do, how much more so for “Torah authorities” or “Torah leaders” to be doing! Ameteur – Chassidim have been “flying” this way for at least 250 years, (and sometimes they fly really high, if you know what I mean…). And, of course, Catholicism has been “flying” this way for centuries. Just because you don’t like it and it’s not the traditional Judaism you grew up practicing, doesn’t mean it can’t be done with success. You just don't get it, do you? If a Gadol says it's no, then it's no. It's not an opinion thatit's treife. It IS treife by virtue of his saying so. Any "American" rabbi who disputes the opinion of a such a Gadol is no rabbi, and probably not even a real Jew. Salmon is an excellent source of Vitamin D! This is a very interesting development. Now, you can cite R. Elyashav & R. Wosner in your list of acharonim who clearly state that the Chazal made errors in science. I take this as an attempt by these rebbeim to direct their followers toward a more evidence based analysis of chazal. Through the enactment of a chumra, these rabbeim are forcing their followers to accept that the Chazal erred. I presume that this is why they are making the innovation to which you refer. It is a bidieved innovation. If you, chas v'shalom, don't know that Chazal erred in science, you have this chumra to force you to admit it. On the other hand, if you already know that Chazal erred in science, you go on lichatchila....without the innovation. Gary, they don't admit that Chazal erred. They claim that these parasites are somehow different from the ones that Chazal spoke about, which are mysteriously extinct. "Ameteur – Chassidim have been “flying” this way for at least 250 years, (and sometimes they fly really high, if you know what I mean…). And, of course, Catholicism has been “flying” this way for centuries. Just because you don’t like it and it’s not the traditional Judaism you grew up practicing, doesn’t mean it can’t be done with success." I'm sorry, but that just isn't true. Firstly, Chasidism has changed over the past 250 years, from most followers being "bagel and lox" (or rather Chulent and Kugel) Jews, to being educated ones. Secondly, Chasidic dynasties were local, and did not claim to speak for all of Israel. Thirdly, "asking the rebbe", and getting a personal answer, is a long established tradition. Not, halacha m'Fiat. Catholicism, is not Judaism. It's also the major religion with the worst abuses and corruption in history. Not something I would want to be compared to. As someone else mentioned earlier, this really is akin to Conservative Jews who insist they follow halacha, when those who are objective know they are not. The Charedim are doing the same thing, and not following halacha... I wonder if they can still be called Halachic Jews. This isn't about disagreeing with what they say, this is about disagreeing with the entire enterprise /system/ process of pretending to be discussing halacha. I apologize for lumping all Charedim together. I don't know what sect or subgroup it is that follows these "gedolim" that way, or that is comprised of "askanim". However, I do know that there are plenty of Charedim (maybe most?) lviing in places like Har Nof who laugh at these things and do not follow it, and also agree that it is not halacha. AN article in Matzav.com seems to conform what I was saying, that in the eyes of at least one signer -- and I think it's two -- the signers were not saying that they necessarily agreed with the psak, only that it exists. That article makes it all even more weird and disturbing. Not only does R. Dovid Feinstein say that he hasn't studied the topic himself, even R. Elyashiv says that he hasn't studied it! So the point is that the letter of the American Rabbis has no meaning whatsoever, other than as testimony that someone is working behind the scenes and twisting arms in order to push this halachic position. Next question: What motivates that person? As you know from the Slifkin ban, the key to understanding these things comes not from studying the letters, but the motivations of whoever is behind it. Running around and pressuring people requires lots of energy and time. Publicizing it requires lots of money. The sad fact is our system has become corrupted by those seeking to gain power and authority and by those too frightened to take a stand. For all their supposed kedushah, These religious authorities (or at least their handlers) are just partly assimilated into the political game that feeds their families and their flock. Huge Yasher Koach to RNS for his unyielding efforts to challenge this bizui. Chassidic Rebbes generally do not pasken halacha. Their dayonim do so. Isaac, I protest your mocking of the Rabbonim and am surprised that it was published. Actually, I have similar criticisms of Rabbi Bleich's article. It will be the subject of the next post. As you can see, my comment has been removed from the blog. R. Slifkin obviously believes it to be going to far for his blog, and would distract from the true purpose of his blog. And he is certainly entitled to his own opinion on his own blog. I on the other hand, believe it to be suitable, and offer no apology. Because everyone is entitled to their own opinion. And mine is, (and derived from my experience with, and of knowing the Feinstein family well, as other Rabbis, and not to mention Schechter,) that my comment reflected their true essence, and the true motivation behind their decision to sign and publicize this Pask Halacha.